What Is An Outline Plan? Outline plans are detailed, 2D drawings, drawn to scale using information gathered from a site survey. They show the garden from above, and set out all the elements of a garden design. Clear labels add detail to the drawing. Supplemental sketches may be included to aid visualisation. These might include a side elevation drawing if changes in level are proposed. 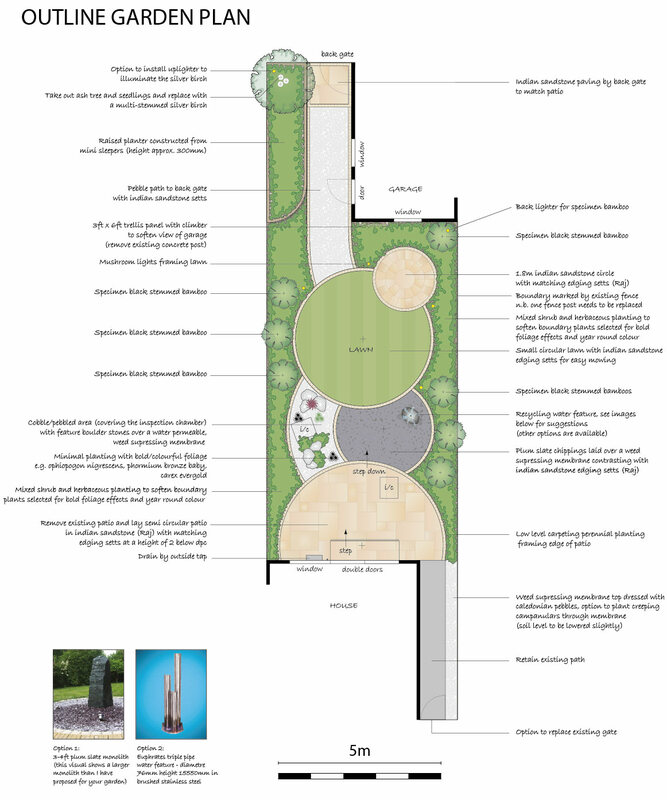 Our outline plans specify the hard landscaping materials to be used, but the planting areas are blocked out. An indication of specimen plants and the type of planting proposed may be included, but details regarding planting are not included at this stage (a planting plan contains details regarding plants). We typically supply A1 drawings at a scale of 1:50, this means that 2cm on the plan equates to 1 metre on the ground. Larger gardens are drawn at a scale of 1:100 (1cm on the plan = 1M on the ground) or 1:200 (0.5cm on the plan = 1M on the ground).